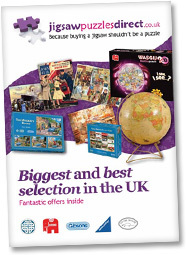 Jigsaw Puzzles Direct are committed to protecting your privacy. All information will be collected lawfully and in accordance with the Data Protection Act 1998. We will only collect personal information when you provide it to us on our enquiry form. You can check the information that we have about you by emailing us. If you find any inaccuracies please let us know and we will delete or correct it for you. We will not email you in the future unless you have given us your consent or pass your email address to other websites unless you agree and we do not send marketing emails to personal email addresses (spam). We use technology to track the patterns of behaviour of visitors to our site. This can include using a "cookie" which would be stored on your browser. You can usually modify your browser to prevent this happening. The information collected in this way can be used to identify you unless you modify your browser settings. This does not affect your statutory rights as a consumer. If you have any further questions please contact us.